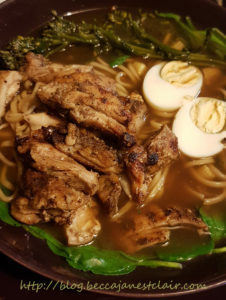 A few days ago, a member of my slimming world group posted a picture of a delicious looking Japanese Ramen style soup her husband had made. Based on her photo, and a recipe I found on BBC Good Food, I came up with this. It reminds me of the kinds of meals you can get at Wagamama. 1. Slice chicken breasts into strips and coat with the Chinese five spice. Spray a pan with fry light, and fry strips until golden, or use a griddle pan. Set aside. 2. Add the water, stock cubes, soy sauce, purple broccoli, baby corn, spring onion, and carrot to a pot and bring to a boil. Allow vegetables to cook through. 3. Add Ramen and cook according to package. 4. Place one handful of uncooked spinach in the bottom of each bowl and slowly ladle the broth and vegetables on top. Use tongs to extract 3 broccoli sprigs per bowl. Evenly divide the noodles and chicken between the bowls and garnish with egg.